Our Products: 1873 Great Western II Revolvers > "Alchimista"
The EMF Great Western II is made by Pietta's Italian craftsmen in Brescia, a region famous for making guns since before the Revolutionary War. Alessandro Pietta, SASS Life #41531 took a page out of history books and reintroduced the 1873, paired with the 1860 Army grip frame. He added a competition trigger that is wider and set back, allowing for a larger finger in the trigger guard. When you first pick up the "Alchimista", your initial reaction is, "WOW! What a nice feel!" 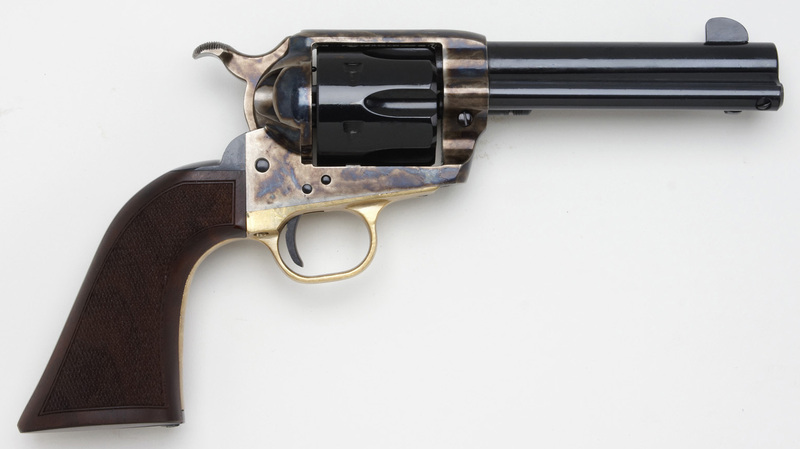 The 1860 grip is longer and slimmer than the traditional 1873 Single Action Army grip. 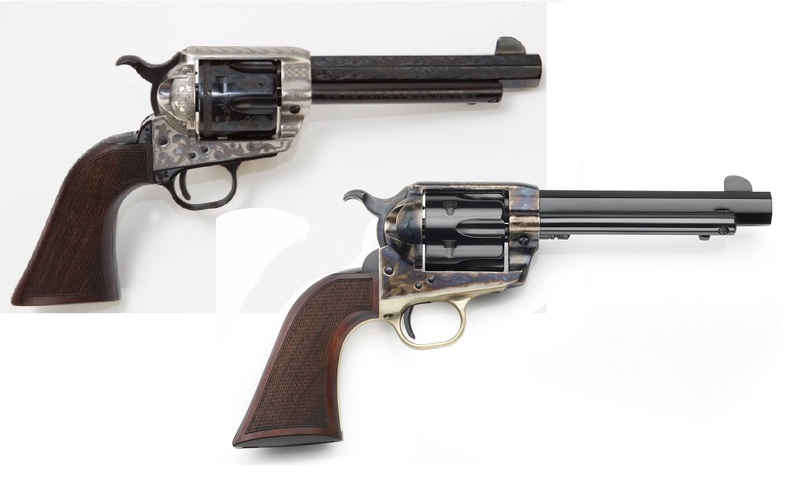 While not quite the 90 degree angle of the Bisley model Colts, it points better and more naturally than the revolvers with the standard 1873 grip. The "Alchimista" with the 1860 grip would be a great addition to your Cowboy Action Battery. The "Alchimista II" includes all these features and a new, lower, wider hammer! The "Alchimista III" in Standard and Deluxe versions. The Standard version maintains the tradition of the casehardened frame, blued cylinder, and EMF's signature brass back strap while adding a distinctive Octagonal Blued Barrel. The Deluxe "Alchimista III" retains the physical configuration of the Standard version, but aesthetically takes it to a whole new level, in engraved Old Silver and Blue, forming a beautiful contrast making it stand out from the rest. 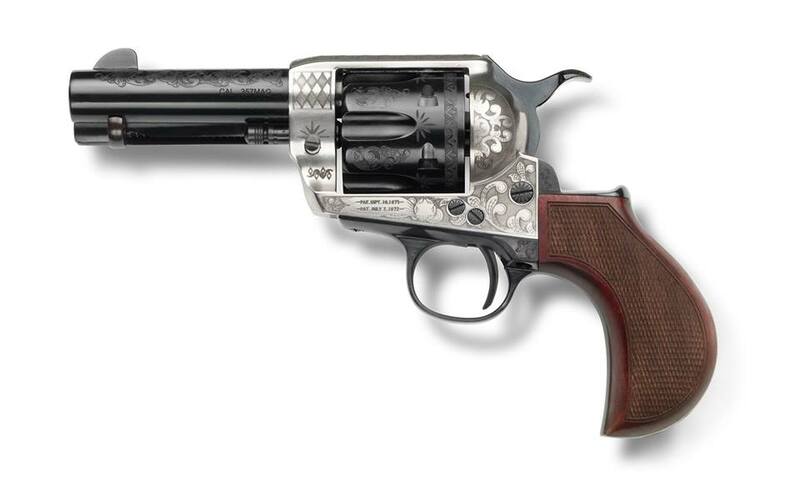 A six-gun anyone would feel proud to carry! The GWII "Alchimista, Jr.” is beautifully engraved in the Old Silver and Blue to match the DLX "Alchimista III" but with a shorter 3 ½” round barrel and Checkered Express Grip Assembly. Available in .357Mag or 45LC, this unique combination makes the "AJ" stand out from the rest of the pack! Browse these categories under ""Alchimista""